Most fruit and nut trees in temperate climate zones enter a dormant phase in the winter. They require a cold stimulus (winter chill) to bloom and set fruit again in the spring. Should winter temperatures remain too high, and winter chill requirements are not fulfilled, fruit and nut trees can develop physiological disorders. Ultimately, they may fail to produce crop yield of satisfactory quality or quantity. PASIT focuses on food stability issues and sustainable agriculture production. Specifically, the project addresses current and potential climate change impacts on fruit and nut growing regions in Tunisia and Chile. PASIT integrates phenological dormancy research and modeling of fruit and nut tree development with comprehensive socio-economic and behavioral data collection and analysis. With this methodology PASIT pursues an interdisciplinary approach: it combines basic with applied research, natural with social science – and it brings its’ research findings directly into practice, both in Tunisia and in Chile. PASIT brings together partners from Tunisia, Chile and Germany. 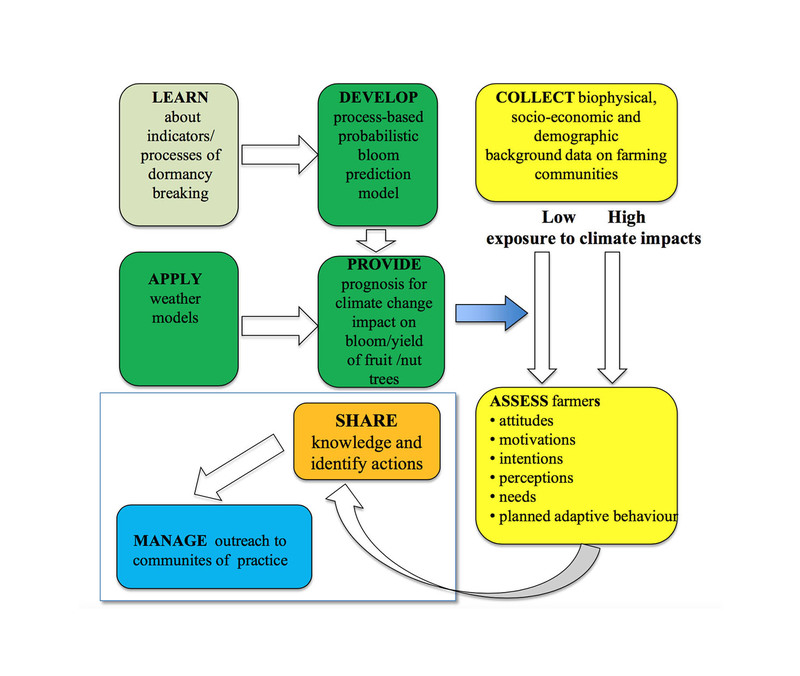 Their expertise spans plant physiology, climate change, prediction modelling, social sciences, economics as well as environmental and risk communication.